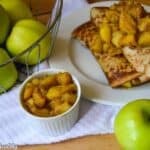 Apple cinnamon pancakes recipe – Gluten free pancakes made from oat flour and free range eggs with a delicious caramelised apple filling. The early part of the week was hilarious, my household just couldn’t get enough of pancakes. In my house we seldom eat pancakes and there’s no reason as to why we don’t either – don’t mind us we’re just a strange bunch of people. Anyway, I recently discovered Jessica in the kitchen, who featured a flourless apple pie pancakes recipe on her website. Upon first impressions what I liked about the recipe was her ingenious method of using oats in place of conventional flour. 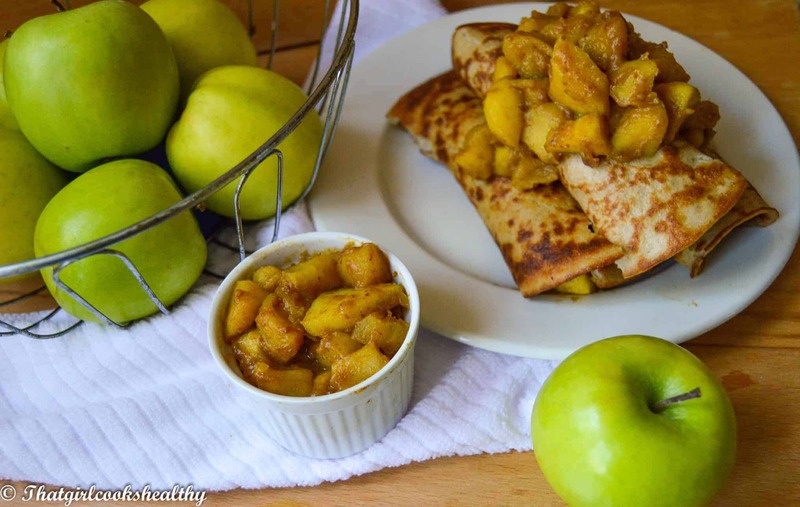 Normally when I make pancakes like these apple cinnamon ones I make them with spelt flour, so seeing an alternative to flour was an offer I just couldn’t refuse. I loved the results – apple cinnamon pancakes which were soft, fluffy with a hint of spice for additional enhancement. Once I made the first batch which I forgot to say, were eaten within minutes. I followed up with several lots of batter on rotation, I soon resembled a one woman factory – flipping and pouring pancakes. 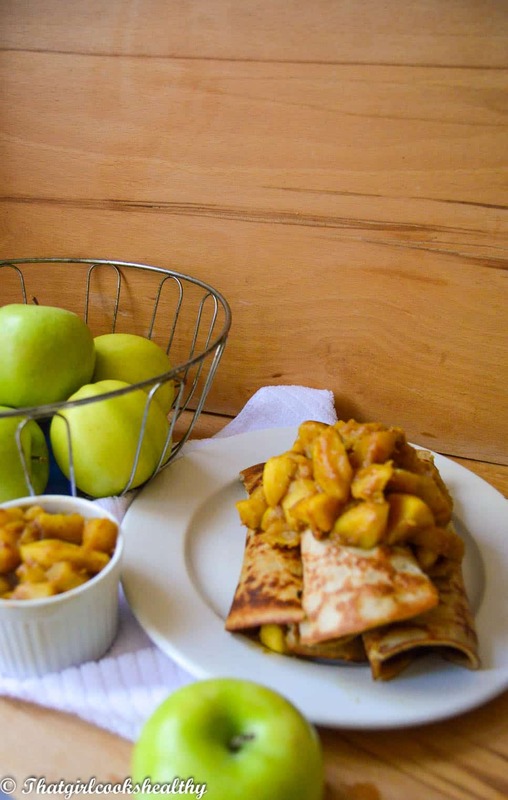 Shortly before making the final batch of apple cinnamon pancakes, I decided to tweak the original recipe by adding some coconut milk and changing the ratio of eggs, oats and creating a caramelised apple filling with date paste. I soon tailored the formula to more thickish batter which was originally inspired by Jessica only with a few adaptations of my own. Place the oat flour into a large bowl, add the rest of the pancake batter ingredients excluding the coconut oil and whisk into a smooth and creamy consistency. Heat the crepe pan (or frying pan) on medium heat and coat the surface of the pan with oil. Ladle the batter onto the pan- swirling and rotating the pan to create a big circle. To make the filling, in a saucepan on low heat, melt the butter and coconut sugar until it dissolves and begins to bubble. Add the apples, spices and date paste to the saucepan and increase the heat to medium. As the apple begins to soften in the date paste, the extract should thicken up a little. Continue to sautee for 10 minutes, stir occasionally. Fill the panckes with the caramelised apple and fold over. Oh this is lovely! So glad to have inspired the crepes and they look great! I’m sure my family would gobble these up too – I love crepes! You’re welcome Jessica, yes we are currently eating crepes a lot more for breakfast now thanks to you ;).